Link to our new Wonder-Wall Part II! The wonder wall was excellent. I think that largely due to the anonymity, we got a page full of valuable questions about feedback and inquiry based learning. I don’t think that we would have had these kinds of questions come up normally on twitter feeds. This Wonder-Wall really provided a place to be ‘vulnerable’, demonstrate a Growth Mindset, and not fear the very real questions that we take with us as teachers. Also, I believe that when we allow our students to engage in this kind of ‘wondering’ activity, we get a sense of ‘where they are at’ in their understanding. Likewise, as educators, when we have these rare moments to ask anonymous questions, we can learn how to help each other move forward. 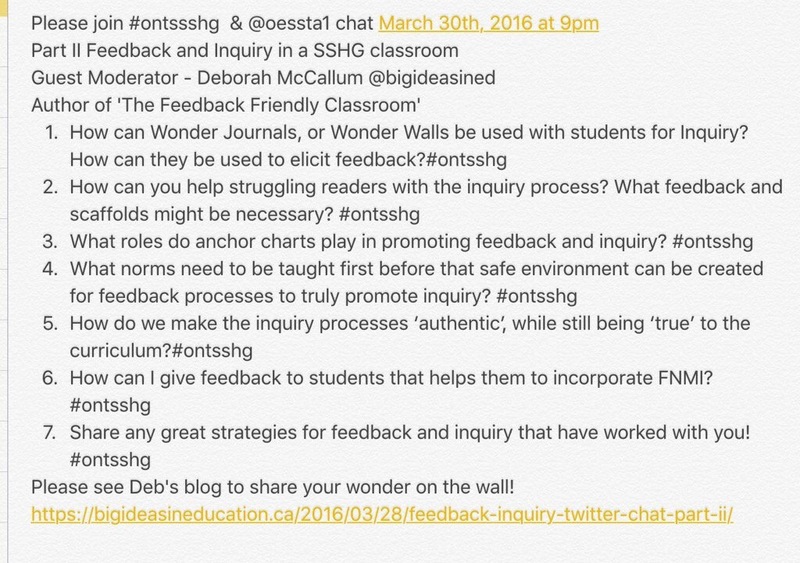 Hence, I did not forget about our shared wonder-wall after our last chat however– I am very passionate about Pedagogy, Inquiry, Feedback and Learning – so I stayed with it, compared it with our Storify, and created about 20 more questions that grew out of your own questions and wonderings. Unfortunately, I cannot address all of the questions in our next Twitter chat on Thursday March 31 at 9:00 PM – But I will add them as an addendum to this blog post, and our new Wonder-Wall. Here is the link to our new Wonder-Wall – and other questions (that won’t necessarily be in our chat on Thursday night) – but might spur some great collaborative knowledge building!! JOIN OUR WONDER_WALL PART II HERE!!!!!!! If you wish to engage in any of these extra questions that I created, right here in the comment section of my blog – please do! I have other questions that we will discuss on Thursday. How can you implement feedback and inquiry processes in Kindergarten? How can I give feedback to students that helps them to incorporate FNMI perspectives and ways of knowing in their inquiries? If in a split grade, should Inquiry questions be kept separate for each grade? Share any great strategies for feedback and inquiry that have worked with you! What feedback can you give to help students, while in inquiry, to move to deeper levels of learning? What role does feedback play in determining how much information students need before and during an inquiry in order to be successful? How can you use feedback and inquiry to properly challenge students who are gifted? In promoting inquiry, are we using feedback and support to always guide students toward the Big ideas? How will I know whether students are using their feedback to improve their learning? For our final reporting methods, what could be the benefits of replacing the final report card with Portfolios full of meaningful feedback from before, during and after student inquiries? Inquiry can take a long time, and not all students are ready to engage in inquiry processes at the same time. How do we differentiate for a whole class at vastly different places in their learning? What feedback strategies can help students ask deeper questions? What preliminary strategies are necessary to build the feedback frameworks necessary to conduct inquiry? What conditions need to be in place to help students seek feedback? There is so much curriculum. Where do we begin? How do we determine what part of inquiry is the most important?